Civilians who have fled fighting in Baghuz wait to board trucks after being screened by members of the Syrian Democratic Forces (SDF). The SDF, backed by a U.S.-led coalition, began the assault on Saturday, seeking to wipe out the last remnants of the jihadist group’s “caliphate” in the SDF’s area of operations in eastern and northern Syria. The enclave is close to the Iraqi border and comprises two villages. Islamic State also still retains territory in the part of Syria that is mostly under the control of the Russian- and Iranian-backed Syrian government. Reuters reported on Sunday night that the United States is likely just weeks away from starting the withdrawal of ground troops from Syria ordered by U.S. President Donald Trump. U.S. Army General Joseph Votel, head of the U.S. Central Command, cautioned that the exact timing would depend on the situation in Syria. 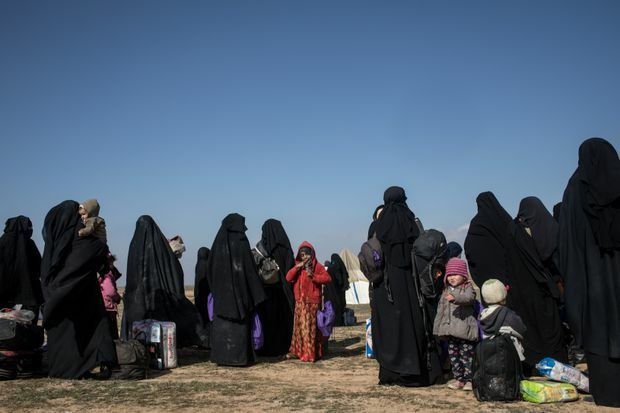 As the SDF closed in, there were reports that two or three Canadian women and their children who had been living in the Islamic State-controlled area had surrendered to the U.S.-backed forces, CNN and CBC reported on Sunday. Alexandra Bain, director of Families Against Violent Extremism (FAVE), told CBC News that one of the women, a mother with two children, contacted her over the weekend from the city of Baghuz. U.S. and French media reports (CNN, The New York Times, France 24) over the weekend said three Canadian women, including four children belonging to two of the women, were detained by U.S.-backed Kurdish forces after leaving Islamic State-controlled areas in Syria. “We are aware of Canadian citizens being detained in Syria. Given the security situation on the ground, the Government of Canada’s ability to provide consular assistance in any part of Syria is extremely limited,” Global Affairs spokesperson Richard Walker said. “The Government of Canada is engaged in these cases and is providing assistance – to the limited extent possible. Canadian diplomats have established a communications channel with local Kurdish authorities in order to verify the whereabouts of some Canadian citizens. Reports of an agreement concerning the repatriation of Canadian citizens from Syria are false,” he added. SDF fighters have so far seized 41 positions but had faced counterattacks early on Sunday that had been repelled, Mustafa Bali, head of the SDF media office, told Reuters. Mr. Trump said on Wednesday he expected a formal announcement as early as this week that the coalition had reclaimed all the territory previously held by Islamic State. Mr. Bali said 400 to 600 jihadists were estimated to be holed up in the enclave, including foreigners and other hardened fighters. Between 500 and 1,000 civilians are also estimated to be inside, Mr. Bali said. More than 20,000 civilians were evacuated in the 10 days leading up to Saturday, he said. “If we can, in a short time frame, get the (remaining) civilians out or isolate them, I believe that the coming few days will witness the military end of the terrorist organization in this area,” Mr. Bali said.